For the record, the $20 million leadership gift that Donald and Ellie Knauss made to USD’s School of Business really is a donation. But at the ceremony announcing the gift in late November, Don Knauss had a different word for it. The new facility, which will be named for Don and Ellie Knauss, will be located adjacent to the school’s current headquarters, Olin Hall. Following construction of the new building, the two structures will comprise a consolidated business school complex. The gift will be leveraged to raise additional resources for the complex, which will triple the School of Business footprint on the mesa. The project is expected to cost approximately $67 million and be completed by 2022. Knauss says there were three driving factors that motivated the decision by him and Ellie to make the gift. “First, a strong belief in USD’s mission of developing leaders who are dedicated to ethical behavior and compassionate service to others, most notably the people at USD who are committed to fulfilling the mission,” he explained. “Second, a belief in a free enterprise system that requires a creation of wealth and that it is done on an equitable and fair playing field so that everyone, regardless of background, has an opportunity to maximize their God-given talents and to create that kind of path forward in business and for business leaders. Dean Gómez said that consolidating its educational offerings into one location will by itself improve the quality of the educational experience. Having long ago outgrown its Olin Hall home, many faculty offices and classrooms are scattered throughout campus and in Alcalá West, at the bottom of the hill. He expressed gratitude to the Knausses for their dedication to the School of Business. 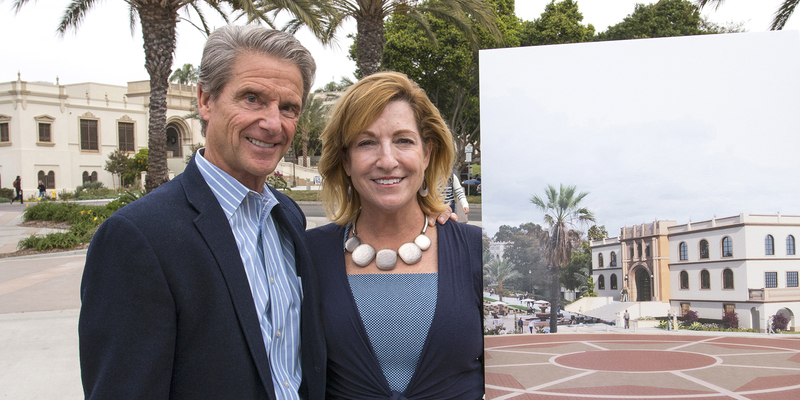 “The generosity that Mr. and Mrs. Knauss share with us today enriches and enhances our education with purpose. It takes our school to the next level in our capacity to serve,” said Gómez. positions in marketing and sales with PepsiCo, Inc. and Proctor and Gamble. Knauss also served as an officer in the United States Marine Corps. In announcing the gift, USD President Jim Harris noted that Knauss is a recipient of the ROBIE Award for Achievement in Industry from the Jackie Robinson Foundation, in recognition of his work in cultivating a diverse workforce and promoting youth development. To learn more, go to sandiego.edu/knauss-gift.